Winter’s coming around and in just a short while, winter weddings are going to be upon us as well. While you may already have an idea of what you want to wear and how you want to decorate, you may be a little sceptic about your food and drinks menu. Of course, that lassi you had at your cousin’s wedding isn’t going to do the trick here, no matter how yum it was. Your goal here is to stay warm! Agreed, it’s not like it snows and drops below freezing in India but it can still get quite chilly. So apart from covering your gorgeous lehenga with a shawl, how do you keep the energy going through the night? By warming up from the inside, of course. Hot sips of delicious beverages not only are a treat to the taste buds but will also keep you pumped for the long fun-filled night you and your guests have ahead of you. Okay, who doesn’t like hot chocolate? Not only is it super-simple to lay out, but you can also have your special variations. Try hot chocolate in shot glasses topped with whipped cream for a sweet treat everyone would love. Having marshmallows to dip is also a fabulous idea. My personal favourite? Add a liiitle bit of dark rum! Trust me, it tastes heavenly. Instead of having your guests wait till dinner for some warm soup, serve it out in convenient shot glasses that they can grab whenever need be. Have some sides like toast to go along with that. The best soup to pick would be hot and spicy tomato soup. Make sure they’re nice and creamy! A cue from the west, maybe? Hot apple cider with a cinnamon stick on the side serves for a delicious and not-commonly-used drink at an Indian winter wedding. Serve it out in hollowed out apples for that extra touch that your guests will love! You could have it both non-alcoholic and alcoholic. The alcoholic one is generally referred to as hard cider. A nice, casual touch to your big fat wedding! Maybe skip the sutta that goes along with it and replace it with a cigar for a fancier touch? :D Plus, that cigar could do wonders in the cold. Serve it out in kullad cups for an authentic feel. 9 in 10 people love coffee. You know you love coffee too. So why not add that everyday addiction to your winter wedding day as well! A nice hot cup of coffee could warm you up in a jiffy plus all that caffeine would also keep you alert through all the mandatory hi-hello-congratulations. A coffee bar is a great idea, allowing you and your guests to go and get a quick drink whenever y’all feel like. 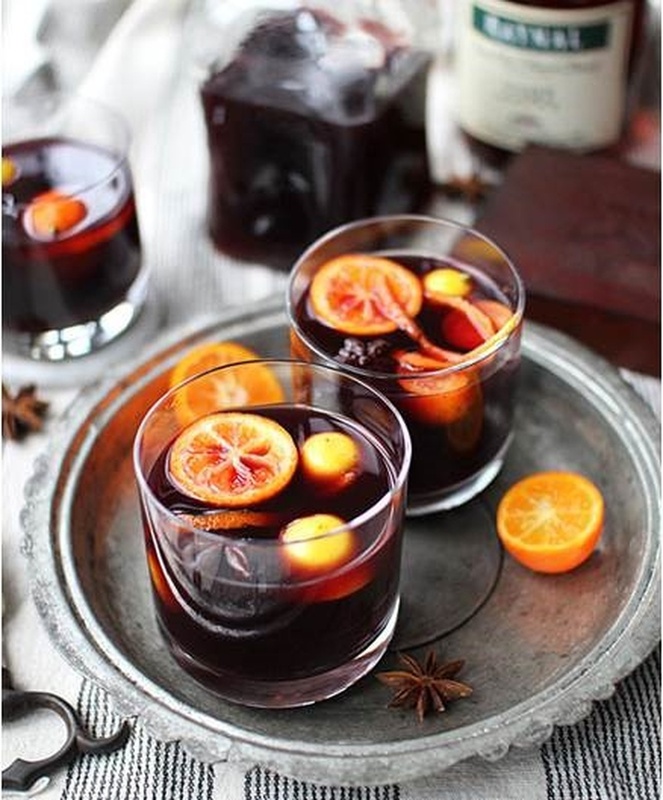 Mulled wine is a drink made of red wine with spices and sometimes raisins. Served hot or warm, it makes an ideal winter wedding drink. Have it served in 200 ml glass mugs with an orange slice to garnish. The sweet heat from the ginger does wonders on a cold winter wedding day! It gets its flavour from the ginger root being directly brewed and fermented with sugar and water. You could also add it to other drinks for a warm effect. The best way to serve it is in a glass topped with rum and lime juice.